Search For "Pharmaceuticals" Companies in Honolulu, Hawaii - Click Here Now! PROTANDIM ELIMINATES UP TO ONE MILLION FREE RADICAL MOLECULES A SECOND, 24 HOURS A DAY, WITHOUT BEING DEPLETED. 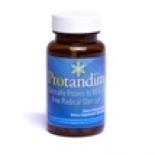 Protandim in Honolulu is a company that specializes in Medicinals & Botanicals. Our records show it was established in Hawaii.